In this ‘always on’ world, where the demands on our attention have never been greater, what’s the secret to powerful engagement? Weber Shandwick UK recently released The Science of Engagement, a new initiative built on the thinking from world-renowned academics from the fields of neuroscience, psychology and anthropology. The Science of Engagement sheds new light on the fresh challenges and opportunities facing communicators and marketers in the digital era and suggests that a new approach must be found in the increasingly competitive quest for audience engagement. Weber Shandwick collaborated with behavioral insights agency Canvas8 to produce The Science of Engagement report – an exploration into the true nature of engagement, what it means and what triggers it. Separate scientific perspectives on engagement from three world-leading scientists from the fields of neuroscience, psychology and anthropology. 19 elements of engagement – the personal motivators that drive people to engage. 38 definitive drivers of engagement: coordinates that will help communicators and marketers build cut-through campaigns in an increasingly competitive environment. A diagnostic model that enables brands and businesses to build their own engagement footprints, highlighting the critical drivers for their markets and enabling them to understand how their brand, reputation or issue of interest compares against their competitive set. 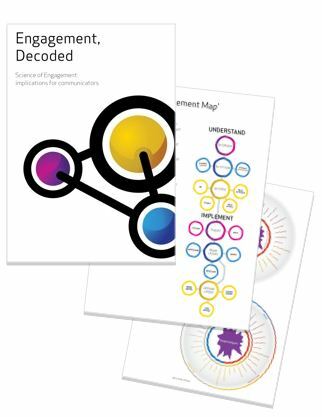 A ‘Total Engagement Map’ which flags the six dimensions that brands and businesses need to consider as they seek to develop engaging campaigns. The report and white paper offer valuable guidance and insights and are available for free download at the Science of Engagement website.